Apartment hunting is one of the biggest challenges outside of school that college students face. 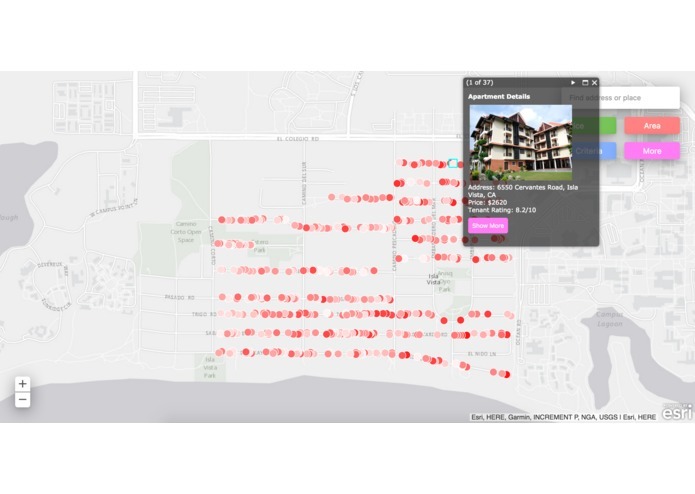 It's particularly notorious in Santa Barbara because buildings belong to different realtors who all have different websites and application processes. 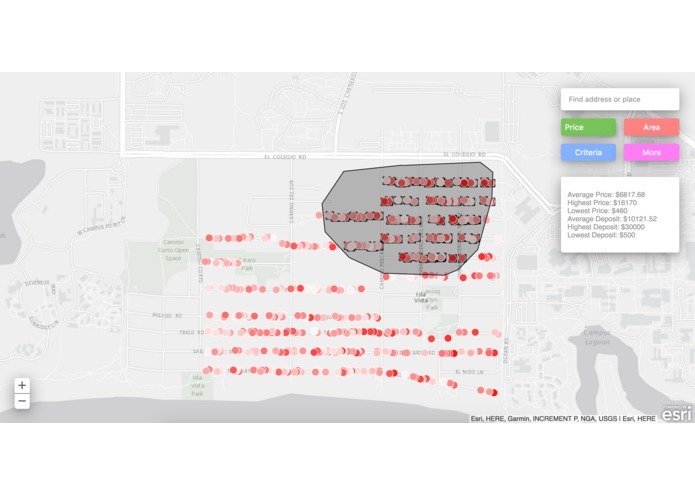 To efficiently track down housing options, the only way would be to physically walk down the street and write down the information as you pass it. 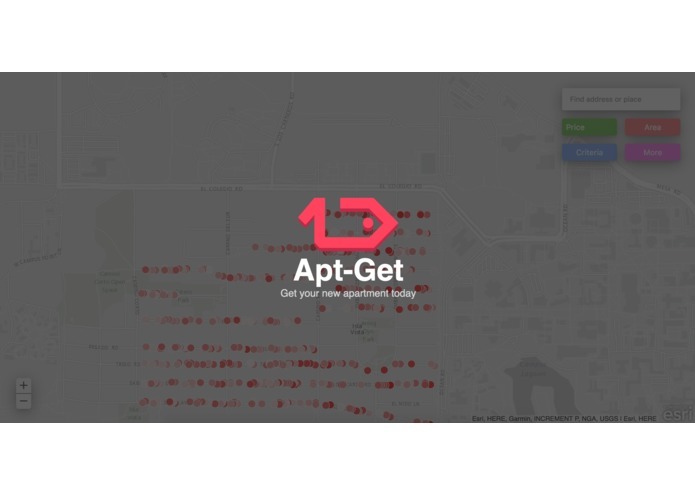 This struggle led us to our idea: Apt-Get. 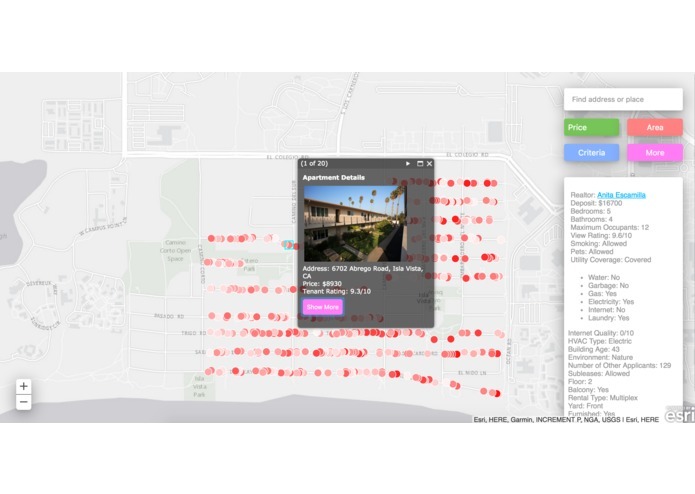 Apt-Get is a website that contains an insane amount of data about apartments in Santa Barbara. It has dozens of customizable query options, all separately toggle-able, and various different sorts and selectors so you can find the right apartment for you. It has search features, website listings, area selection functionality, and a lot of customization. For example, Apt-Get can serve you a list of apartments which are non-smoking, allow pets, have low deposits, are under your budget, and have granite countertops in one go. The most difficult part of this project was figuring out how to geocode (convert addresses into lat/long) and dealing with the APIs. There was a lot of documentation to dig through, but through dedication and good examples, we pushed through. We are very proud of our product, because of its full functionality and usefulness to a large group of people. The area sort was particularly difficult to implement and its applications are enormous. It's always satisfying when the code works in your favor, and it certainly did so this time. We're also proud of our CSS and our work into beautifying the site, which I believe adds a lot more impact and usability. Apt-Get needs two things: users and data. For the former, we know that UC SB students will love our site, because the apartment hunt is extremely difficult otherwise. For the latter, we plan to collect it ourselves manually and reach out to realtors. Once our database has enough entries and has helped enough people find housing, we can begin to charge for our services and sustain our site. Logo design and general branding. Initial mockups and design. UI design for splash, pop ups, and info windows. Wrote xml parser to read data from OpenStreetMap. Also wrote scripts to provide realistic map data based on several features. 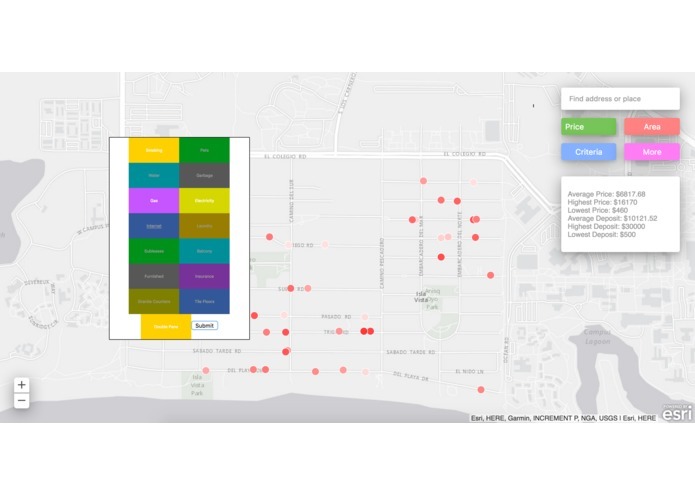 Created map and the query calls to the Esri API, as well as the area drawing and relevant information calculations. Front-end implementation of part of the UI.